Vegetables are the nutritional backbone of a healthy diet. Don't push them to the side of your plate! Make friends with the produce department for better health and performance. If you listen really closely, you can probably still hear echoes from the collective gasp of parents nationwide after NFL star Colin Kaepernick posted an Instagram photo of his steak, eggs, and fruit lunch last July. The caption read, "This is lunch. I don't eat vegetables. They make you weak!" After the initial shock waves and media attention started to die down, parents everywhere were left with the already tough task of trying to convince their kids and teenagers that they really do need vegetables in their diet. And though Kaep was right on with his high-protein meal for building muscle, he left many people perplexed. Do vegetables actually play any role in building a strong healthy body? The vitamins and minerals stacked within vegetables are crucial for overall health and muscle growth. Diversity of veggies = diversity of vitamins and minerals. Many former and current world-class athletes would answer in the affirmative. Football great Joe Namath; Martina Navratilova, who was a vegetarian during most of her tennis-playing years; MLB first baseman Prince Fielder; and six-time Iron Man champion Dave Scott are all fueled by a vegetarian diet, to name just a few. But you don't have to go completely vegetarian to reap the rewards of adding plants into your diet. In fact, you skimp on them at your own risk! Vegetables are loaded with vitamins and minerals that are crucial for bodily health and growth. The best multivitamins can't come close their overall nutritional power, and even if they could, your body would still make better use of the same nutrients in plant form. "A diet rich in colorful vegetables protects your body from the damaging effects of unstable free radicals and combats inflammation." A couple of examples: the B vitamins found in green leafy veggies help convert the food we eat into usable energy (in addition to many other functions); and other vitamins and minerals help facilitate countless chemical reactions in the body. Plus, antioxidants, as you've no doubt heard, help decrease the free radical-induced inflammation, oxidative stress, and subsequent muscle cell damage we incur from training and other stressors. So why not just pop an antioxidant supplement and call it good? First off, scientists have yet to uncover all of the actions of antioxidants in the human body, and there is a plethora of antioxidants which haven't even been identified yet. And though some antioxidants are sold in supplement form or added to protein drinks, nutrition bars, and other foods, there is a synergistic effect of antioxidants found naturally in vegetables that science simply can't replicate. A vegetable's color signifies its array of antioxidants, such as vitamins C and E, carotenoids, and polyphenols. Eat a full range of green, yellow, red, and other colors to receive the maximum benefit! In short, experts don't know every reason why vegetables work, but it's clear that they do—and better than any man-made substitute. This is reflected in studies of populations with primary plant-based diets. Over time, people in these cultures are far less likely to be obese; they enjoy a longer lifespan; and they have a decreased risk of developing a number of chronic diseases. Some exercise-induced inflammation is normal, and even necessary for the body to adapt to greater training loads. However, excess inflammation can be detrimental to athletic performance in the short term and health in the long term. How much is too much? Scientists don't know for sure, although an increasing number of researchers theorize that chronic inflammation contributes to everything from cancer to obesity, type 2 diabetes, and Alzheimer's. Eating a diet rich in colorful vegetables is known to protect your body from the damaging effects of unstable free radicals and combat inflammation. The general admonishment to "eat more veggies" is perfectly legitimate, but if you're looking for a more concrete recommendation, here are three veggies you should get to know. This goes for all dark green leafy veggies, but I'll give kale top billing to emphasize that its growing popularity is well-deserved. 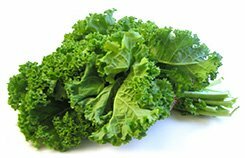 Kale is a nutrition powerhouse, packed with fiber and copper—one nutrient that is hard to get in a normal diet—and an excellent source of manganese, iron, vitamins C, A, and K, and myriad phytonutrients. If you're wondering what to do with this prehistoric-looking green, you could sautee or steam it like spinach. Even easier, cut out the rib, chop the green, and use it in a salad. Or you could follow A-Rod's lead—in the kitchen, that is—and whip up a batch of baked kale chips. Many athletes replace traditional potato or tortilla chips with kale chips because they are lower in calories, easy to customize, and packed with nutrients. Lest you think that shredded iceberg lettuce on your burger is just as good, let's be clear: Green leafy vegetables are not all created equal. Choose those that are dark green in color and you'll get greater nutrition bang for your buck thanks to the fiber and nutrient content. Dark green leafy veggies contain folate, which has been shown to boost vascular function and blood flow, as well as the antioxidant lutein, which is found in the retina and helps eyes adjust to bright light and filter out harmful blue rays. 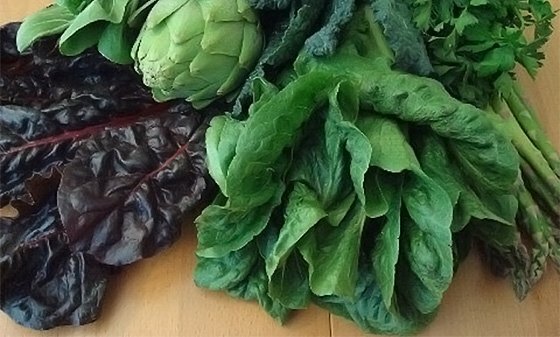 There are many dark green leafy vegetables to choose from: zesty arugula, crisp romaine lettuce, or spinach with its softer texture and slightly bitter taste. Aside from salads, dark green leafy veggies can be added to any number of dishes. Give sandwiches or wraps a little crunch by adding romaine. Get creative with cold quinoa, barley, or rice dishes by adding chopped spinach or arugula. And as Chicagoans have long known, you can also top pizza with spinach or other greens. Seconds after Usain Bolt broke the world record in the 100 meter dash at the 2008 Beijing Olympics, his father Wellesley famously revealed his son's performance-enhancing secret: "It is definitely the Trelawny Yam," the elder Bolt told reporters. "Yams are excellent sources of vitamin C, manganese, fiber, and vitamin B6, among other vitamins." While the world's fastest man has a clear preference for his hometown's namesake tuber, the rest of us have more options. Yams come in a number of varieties with flesh ranging from white to purple, and skin that may be white, pink, brown, or black. They are all excellent sources of vitamin C, manganese, fiber, and vitamin B6, among other vitamins. 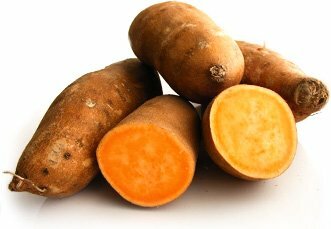 Yams are also rich in potassium, a mineral that helps keep blood pressure within normal limits and can prevent muscle cramping. Plus, as Bolt knows, yams are a great source of complex carbohydrates for lasting energy. If you, like many people, go to the store to buy yams and end up buying sweet potatoes instead, don't sweat it. While the two aren't identical, sweet potatoes are also a great source of complex carbs, vitamins A, B5, and many of the other nutrients as yams. In fact, they're even richer in a number of cases. The secret is out! Athletes everywhere are gulping down beetroot juice, and beet extracts are increasingly showing up in pre-workout supplements. Don't write this off as just another fad, because a growing body of research supports the potential benefits of nitrate-rich beets and beet extracts for athletic performance. In the body, nitrates are converted into nitrite, which then generates nitric oxide, a short-lived gas that expands blood vessels for greater blood flow, improving oxygen and nutrient delivery to working muscles. But there's a caveat: Don't consume mouthwash or take antibiotics along with your beets, because these bacteria-fighters kill the good bacteria that is necessary for converting nitrates to nitrites. If guzzling beetroot juice sounds a bit out of your comfort zone, start incorporating beets into your diet for a regular source of nitrates. They're sweet and add a visually appealing crimson pop to your dishes. 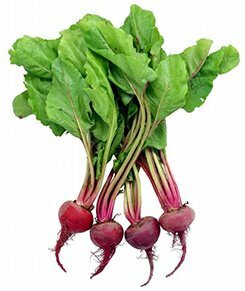 Beets also contain both folate and betaine, both of which help lower levels of inflammation in the body. Toss raw, shredded beets into a salad, or better yet, roast them to bring out their sweet flavor and tender texture. You can buy beets trimmed, but it's even better to buy them with the greens still on. Beet greens are a healthy green which lend themselves well to quick a saute or boil. They wilt quickly, but you can often revive them by trimming them and soaking them in cold water for a half hour. Whatever you do, don't toss them away!